In episode four Tyrion arrives at Winterfell on his way back to Kings Landing from the wall and talks to Bran. He even gifts him with a saddle so that he can ride again with Tyrion sympathising with Bran’s plight as he himself is considered less than a person by the majority of other people. He also has an interesting scene with Theon baiting him for being the lackey of the Starks. However things don’t go well for him later when he winds up in a tavern where Catelyn Stark is staying, the one person who thinks that he is responsible for the attack on her and on Bran. Of course I suppose it could be argued that Tyrion was merely doing this out of courtesy and that he is just as cunning and evil as his brother and sister. He is certainly cunning enough to do that but it just never rang true for me that it was Tyrion who had done it when it seemed obvious to me that it was more likely to be the work of Cersei and Jamie, who both have a reason to silence Bran, which Tyrion doesn’t have. 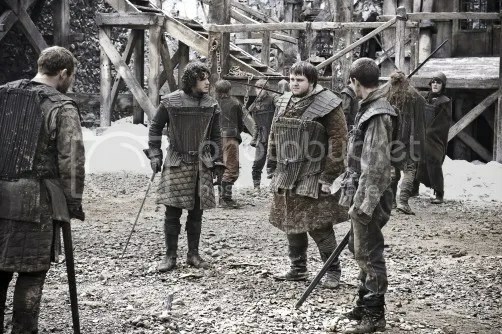 Ned finds out that the former hand Jon Arryn often consulted Pycelle about the histories of the Seven Kingdoms which he had taken a very strong interest in. When Ned’s starts leafing through the books he understands why Arryn was so interested and realises why he was ultimately killed. He also came across one of Robert’s illegitimate sons who unlike his supposed children had dark hair, which was something that Ned noticed was the description of every Baratheon, apart from the children of Robert and Cersei. Ned’s eldest daughter Sansa has been betrothed to Joffrey whom she pretends to love but starts to hate him each time she meets him and each time she hears bad things about him, which is most of the time to be honest as he really is a horrible little scrote of the highest order and you just feel for poor Sansa who is such an innocent girl who doesn’t deserved to be saddled with Joffrey even if it is a good match for the families. We met a new recruit to the Night’s Watch in the shape of Samwell Tarly who really wasn’t designed for life on the wall but takes everything in his stride and is another character I have a great deal of time for. After time spent with the Khal Daenerys’ is now starting to show a backbone especially when it comes to her brother who is still acting as if he is in charge of the whole situation and still treating her like his property to do with as his please and still thinking that the Dothraki tribe are his to command, even if none of them so much as lift a finger at his command. Daenerys finds out from Ser Jorah that it is unlikely that Viserys would be able to take the Seven Kingdoms with the Dothraki army even if they would obey him, which they do not. Things are building up really nicely now and it is sometimes very difficult to know which characters to trust and which to take with a very large pinch of salt, which makes the series more interesting for me as even the characters who are supposed to be the baddies are not that much different to the ones who are supposed to be the good guys, as that doesn’t apply in this series at all, all for the better if you ask me.